Chris leads the learning strategy of the DSDR as part of the Senior Management Team, as Staff Development Lead. 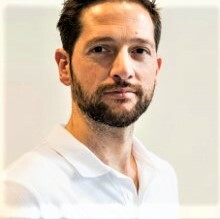 Chris manages a team of practitioner-educators across various disciplines of sport, and delivers performance focused projects that incorporate learning and development themes. He has recently started coaching more actively in the network over the past nine months and is currently coaching a small group of individuals across a range of themes and focuses. Chris is pro-active in embedding coaching as a management style, and working to train and develop coaches amongst DSDR as part of a coaching culture exercise. Developing people and performance through organisation theory, and the use of learning and development practices. Working collaboratively to drive organisational performance through people, and supportive of challenging bureaucracy to instil a learning culture by using creative, strategic and empathetic approaches to work. An educationalist and management professional, Chris has spent over 12 years developing people through education and training, in both design and delivery. Chris takes a strategic approach to people development across the department, and is actively delivering the ILM accredited leadership and management training, which includes coaching.